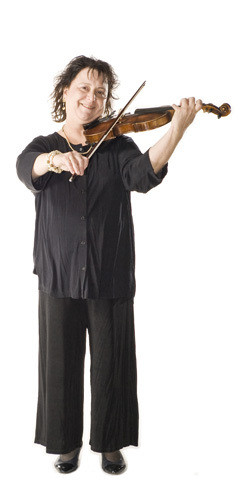 From fourth grade until high school graduation in 1971 I was fortunate to study violin with Professor Margaret Wiles. She lived on the grounds of Connecticut College in New London, CT with her campus minister husband. She was a wonderful teacher and personal mentor. Her credentials included playing in a string quartet that performed a weekly radio show in South Africa during the war. High School was filled with musical highlights: I played in competitions, talent shows, pit orchestras, Connecticut College’s civic orchestra, CT Regional and State orchestras, MENC Eastern US Orchestra in Atlantic City under Morton Gould, and All-US Orchestra at Carnegie Hall in NYC under Frederick Fennel. During the last two summers, I attended Tanglewood’s Young Peoples Orchestra Program, taking violin lessons with Dr. Roman Totenberg and playing under the batons of Michael Tilson Thomas, Leonard Bernstein, and Seiji Ozawa. stra, the latter of which I continued when I moved back to Boston, graduating in 1975 with a bachelor’s degree in Music Education and a minor in performance. I didn’t feel ready to teach music full time, so after a summer-long, cross country camping trip, I entered a master’s program to study educating visually impaired children. Boston College and Perkin’s School for the Blind collaborated in this immersion program. Half of my classmates were recruited from foreign countries: Peru, China, India, and Africa. We went to classes together at BC, lived in the dorms at Perkins, and served as dorm assistants for the blind and deaf-blind students with whom we lived. As if this wasn’t enough to do, I audited an early morning violin pedagogy class taught by Dr. Kenneth Sarch at the New England Conservatory of Music. In September of 1976 I was hired to start a special education program in the county just north of Springfield, MA, identifying and then educating visually impaired students, ages 3-22. I replaced myself with two teachers when I moved two years later. In the summer of 1978 I loaded what would fit of my possessions into my Mazda wagon and a friend’s van and we caravanned to Tucson. I hoped to establish a full life in a place that didn’t have cold weather. It was 109 degrees the day we rolled into Tucson! Three days before school started I was hired to teach special education classes at Tanque Verde Elementary School. Eventually, I started a before-school violin program, just for fun. To meet new people I played in Orchestai and the pit orchestras of SALOC and the Arizona Opera. TSO principal tubist Michael Sherline pushed and prodded me to audition for the TSO. He even somehow arranged to have the U of A stage for an hour so I could rehearse the audition music where I needed to perform! On the audition day I walked onto the familiar stage, tuned my violin, and almost fainted when someone behind the screen told me that the committee needed a 15 minute break! It took almost a half hour until I was called back! In the end I was thrilled to be offered the second violin chair I wanted. My TSO career began under the wonderful baton of interim conductor Denis De Coteau. During my tenure with the TSO I have done some interesting things. I worked for TUSD #1 as a full time string teacher for about 15 years, during which time I also taught chorus, swing choir, parade marching, drama, and/or Dr. Carroll Reinhart’s Opera project. Many of the years I played viola in a middle school quartet that performed in pre-schools, nursing homes, and a senior center. I studied tax preparation and serviced almost 100 musicians and teachers each year. I traveled throughout Mexico, Europe, Iceland and England. I also played with the Montavani Orchestra for several seasons, including a Japanese tour. I took a year off to earn a counseling certificate from the University of Phoenix and returned to work as a school counselor for 5 years before retiring. a Day Book One before he gave my lesson. Dare I say I’ve been playing for almost 50 years? My first choice was drums. My second was violin. My grandmother had a violin I could use. There were no drums in the family! We were too poor to buy anything else. None of my relatives were professional musicians. Mom plays piano and organ. Her mother and her mother’s brother played piano and violin, as was the custom in Québec when they were growing up. Dad played the radio! His mother’s brother played violin well enough to play in a pit orchestra in NYC. Uncle George’s main occupation was race car driving, though. He died in a race crash when he was about 30 years old. We’re talking 1930’s racing in a black metal car wearing a leather coat and helmet, goggles, and neck scarf. I have pictures! Not really. I can demonstrate several instruments to beginners. I can play hymns on a piano if they are in the key of C, G, or D. Given these constraints, I’ve been known to play at small churches without accompanists. I think what intrigued me about the violin was the different sounds it can make, depending on the style of the music. My grandmother played folk tunes from Canada with a wiggly finger vibrato. The violin playing garbage man became my mother’s friend when they played old fashioned tunes together: “Meet Me in St. Louis”, “Ave Maria”, “Nobody Knows d’ Trouble I’ve Seen”. Once a month the Fiddle club performed in CT: jigs, reels, foot-stomping wonderful music. Erica Morini was the first female professional violinist I ever heard. Her sound was so sweet and beautiful; I was hooked. What advice would you give to kids learning to play your instrument? Playing the violin is easy if you practice. It’s like reading words. You learn to read at school and practice in reading groups. You practice at home and get help from people who read better than you do. Violin is the same. You learn to play at school and practice in orchestra class. You practice at home and get help from expert teachers. How good do you think you’d be at reading if you only read for two half-hours a week? If you could play a different instrument, what would it be? Viola. I actually prefer harmony and lower tones. Second violin is almost low enough. I didn’t change to viola in high school because only students who couldn’t play violin well enough played viola. (BoooHoo!) Now I don’t change because the instrument is too big and too heavy for my older body. Funny Musical Experience: TSO, 1812 Overture, the “clap to find your keys” gizmo went off in my stand partner’s pocket when the percussionists played the canon notes! He was SOOO embarrassed. Most exciting musical moment? : Personally: Sixth grade, end of year school district string orchestra concert in the junior high auditorium. I played a solo from memory with Mom accompanying on the piano. At the end of the piece the audience clapped and clapped. I was unprepared for my feelings. I walked off stage and tears of joy fell from my eyes, not because they liked it, but because I liked it. Mom and the music teacher had to prod me to get me to go back for bows. Professionally: TSO, Maestro Bill McGlaughlin conducted Elgar. At the end, the orchestra stood. I looked around and several other musicians were also wiping their eyes. What might your career be if you hadn’t chosen to be a musician? Accountant. I like math and being organized.